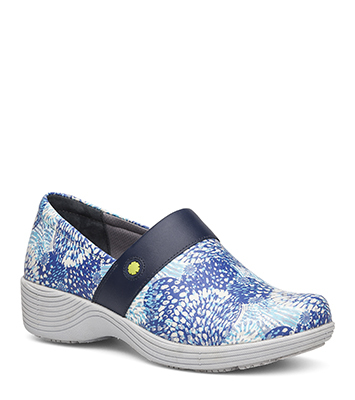 The Dansko Blue Blossom Patent from the Camellia collection. Camellia delivers all-day comfort and support in a work-ready clog. Additional benefits include a removable footbed, moisture-wicking linings, an easy-to-clean upper and a slip-resistant outsole. Non-marking, long wearing, slip resistant* rubber pads with patent-pending design. Moisture-wicking linings treatment with Aegis Microbe Shield® and Cleansport NXT® organic odor control. Lightweight, anti-fatigue EVA midsole, designed for shock absorption and support. *Tested for dry, wet, and oily/wet indoor surfaces. The Fairfax carries the Seal of Acceptance from the APMA (American Podiatric Medical Association). The APMA Seal of Acceptance is awarded to shoes that promote good foot health and is independent proof that Dansko shoes are made with your comfort and long-term wellbeing in mind. Dansko's Fairfax outsole has been tested for Slip Resistance by Precision Labs using the Mark II machine.